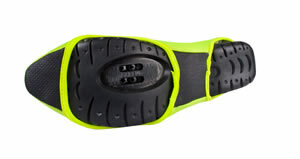 Reinforced shoe soles for walking. Reflective tabs show as a bright moving part in low light environments. 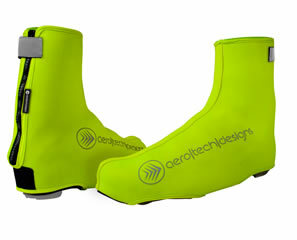 Insulates to keep feet warm while cycling in the cold. Water-resistant - Surface is hydrophobic to stay dry by allowing perspiration to evaporate. Wind-resistant - Barrier reduces wind to keep you warm yet not clamy because it is breathable. Breathable - Wicking Polyester fibers pull perspiration into the surface for evaporation and Insulation. Durable - Fabric is rugged yet delivers soft feeling comfort and warmth. Body: 100% polyester and 3mm neoprene thermal insulation with a nylon face fabric. 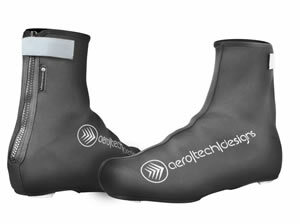 Function: Neoprene Cycling Shoe Cover insulates feet from the cold while cycling. What a difference these make.Makes keeping warm so much easier. Well made,comfortable,and they stay in place. A great thing to have, especially for the price. The shoe cover fits nicely over my sneakers, which is what I ride in. It hasn't been cold yet, so we'll have to see about its ability to keep my feet warm. The Velcro strap at the top may be an issue, as it could rub against the skin due to folding of the neoprene to close it off tightly at the top, but again, it will take a ride or two to see how it works out. I have not used any other shoe covers and maybe all manufacturers make shoe covers that leak through the seams. These are thick and warm and the size (XXL) is good. But water gets in along every seam, especially at the front top - and this was not a particularly wet day, just the occasional shower. Not fully waterproof but helps a lot on cold days. The zipper broke after only a few uses and had to replace it with a paper clip. Otherwise good fit. Decent for the money, way too big. Ordered a size large, but it was way too big for my size 43 mtb shoes. Returned for a medium, it still fits a little loose around the bottom and heel. Not as thick and warm as I had hoped. In very cold weather, I'll wear another shoe cover under it. Decent construction though, and a very good price. Great product awesome price and did what the product said it would do. Simple as that! I am happy that Aerotech makes good gear affordable! Buy at least one or two sizes smaller than the chart specifies.|The ankle opening is sized more for a calf.|The velcro strap has no function other than to relieve the zipper.|Sent back the xls for lrgs (size 45 bonts)|still too big. I have always had trouble with cold feet when the temperature is below 50 degrees. This cover provides good wind resistance and insulation. The only feature I would change is the cutout size for the cleat. It's more than large enough for Look cleats and when most people are probably riding SPD today I'd make the cutout smaller for better cold resistance. These seem like a good product and fit true to size, but when I received them and first tried them on, I noticed that the lower end of the zipper was unfinished and had already started to unravel. I wanted to like them, but didn't have any confidence in their durability, and so returned them. Hate my feet to be cold & these solve the problem perfect. The XXL size fits my size 50 SIDI Dominators! I like the quality of the shoe covers and they keep my feet warm and dry on winter rides. They fit better on mountain bike shoes than on my SIDI Road shoes. They are size Large and I wear a size 9 (42.5 EU) shoe. 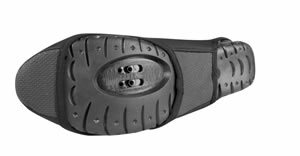 The lugs on the mountain bike shoes are larger and fill up the shoe cover a bit better. Overall I really like them and they are half the price of competitive brands.